Bee lovers and hobbyists can buy professional grade cotton bee suits, bee coveralls, beekeeper clothing from Bee Attire at budget friendly rates. Bee lovers can buy suits as per their needs and body type. Our cotton bee suit is constituted of 280 GSM cotton to prevent the bee sting from reaching your body. Cotton Bee Suit are perfectly meant for professionals as they are sting free. 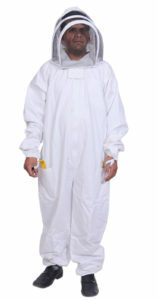 Best Bee coveralls, on the other hand, come with two kinds of hoods. Hoods are both round and may also come with fencing style veil. Our bee clothing attaches elastic loops on the wrists and ankles. Whether you are planning to become a beekeeper or you are an experienced beekeeper, the first thing you need is the cotton bee suit. Avoiding a bee suit is not recommended no matter how experienced you are. When you are working with bees, you need a suit which provides coverage and allows you to get the needed airflow. We are here to offer you aerated suit which is simply priceless. Featuring rounded veil, the bees are kept at safe distance. There is no chance of the veil sticking to your sweaty face and giving you sting. You require a bee suit from Bee Attire to keep the bees away. You have to protect yourself from the stings. With our bee suit, you will stay completely protected. Each jacket and suit is constituted of lightweight materials that are high quality. Our suits feature proper elastic and zippers around the ankles, waists and wrists.